Usually my Mondays do not start until at least 11am, when I drag myself out of bed for a day full of reading. However, today, and every Monday for the next 20 weeks I am taking part in an LJMU Career Accelerator Internship with a Liverpool-based lighting company – Liight Ltd, based in the Bridewell Studios. So, my Mondays will now consist of early mornings and a day of work in a former Victorian police station on Prescot St.
As a final year English student at LJMU, I have spent the last couple of years taking part in numerous projects that involve blogging. This experience from my course has led me to where I am today, the Bridewell Studios. Over the course of a 20-week internship I will be writing content for the Liight website, as well as assisting in the management of the company’s social media platforms. The Bridewell was purchased in 1853 by the Liverpool Constabulary and started its use as a fire and police station. 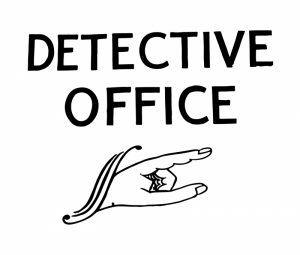 As soon as I stepped through the door I could recognise aspects of the building’s previous life – it does not take a detective to discover the ‘detective office’ sign still mounted on a wall and the prison cells that are still intact. Shortly after my arrival and with a little bit of online research I found out that the studios take their name from their former use as a police station – in the Victorian era, ‘bridewell’ simply referred to any police station that had cells in its building – I’d learnt something already and it was only my first day, success! The Bridewell on Prescot Street, where I am currently located, was one of many in Liverpool, with the ‘main Bridewell’ located on Cheapside, which has recently been opened as a hotel. So, if you want to spend a night in a luxurious prison cell, you know where to head! The main Bridewell had three floors, with cells on every floor, whereas the smaller building on Prescot Street had only 9 prison cells. I came across a poem at the Central Library, that was printed in ‘The Liberal Review’ in 1878, that described the cells in Liverpool’s Bridewells. The anonymous author, writes how the cells were ‘full of nauseous stinks and smells’ and describes how you could always hear ‘moaning and groaning’. Thankfully, this I can tell you, is very different from experiences of the cells today, where some tenants at the Bridewell currently use these same prison cells as their studios! The Bridewell began as a smaller building until 1905 when the building was expanded, having been deemed to have ‘inadequate space and facilities’.¹ So, in 1905 a lengthy process took place to add ‘a house for the Divisional Superintendent, enlarged charge office and parade room’.² This extension took 21 years to complete…and I thought 20 weeks was going to be long! In 1921, prior to the completion of this extension, I also found that the building ceased to be a fire station – you would think they would have made this change prior to the costly extension, wouldn’t you? Nevertheless, the change was made, and the building ran for a further 50 years known as simply ‘Prescot Street Police Station Divisional Headquarters and Bridewell’. Gradually, the building’s use as a police station was phased out as newer, more modern police stations took its place and the Bridewell fell into decline until the 1970’s. I am told that it was in 1976 that a group of artists came along and changed the building’s history entirely. The group began renting the building and created what we know today: Bridewell Studios. 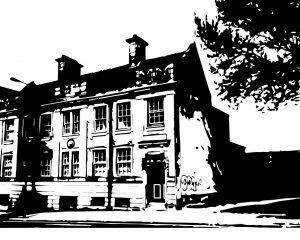 From this point the building began to thrive, in 1981 the studios became a not-for-profit organisation, and in 2007 the Bridewell became a Grade II listed building. Earlier this year, the Bridewell’s resident artists celebrated their 40th anniversary. In its 40 years as Bridewell Studios its history has been a vibrant one having housed a variety of artists from Adrian Henri and Maurice Cockrill, to sculptors Stephen Broadbent and Ian McKeever. 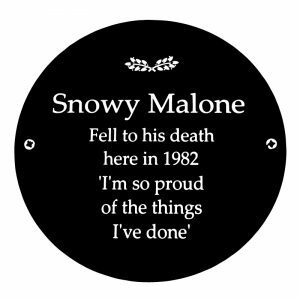 The building was also used in the 1980’s as the set of Alan Bleasdale’s Boys from the Blackstuff, commemorated on one of the stairwells with a blue plaque, showing where Snowy Malone ‘fell to his death…in 1982’. The Bridewell Studios continues to thrive as a hub of all things artistic. Not only does it house some great artists and companies, but it is also used as a gallery to exhibit the artist’s work. So, if you ever walk along Prescot Street and, like me, question the Victorian building seemingly at odds with its surroundings, just know, you’re looking at a place with so many stories within its walls. The studio opens its doors during Liverpool’s heritage days and there are regular exhibitions that are also open to the public – take the opportunity to peek within the walls of the historic Bridewell Studios.